Bubbles, sidewalk chalk, jump ropes and hula hoops were provided for children to enjoy at the Back-to-School Bash in New Haven. Kids also brought their bikes, scooters and skateboards to enjoy while playing in the street. The main road was closed to traffic for the event. 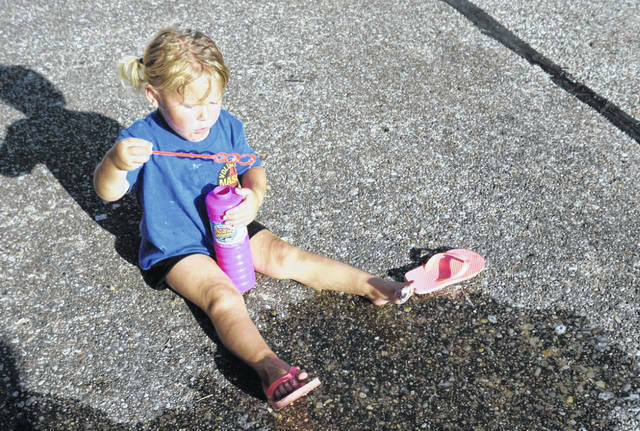 The Town of New Haven sponsored two back-to-school events this week for children in the Bend Area. The first was a “Glow Party” at the municipal swimming pool on Monday, which was cut short by a rain shower. The second was the annual “Back-to-School Bash,” held at the fire station on Tuesday evening. 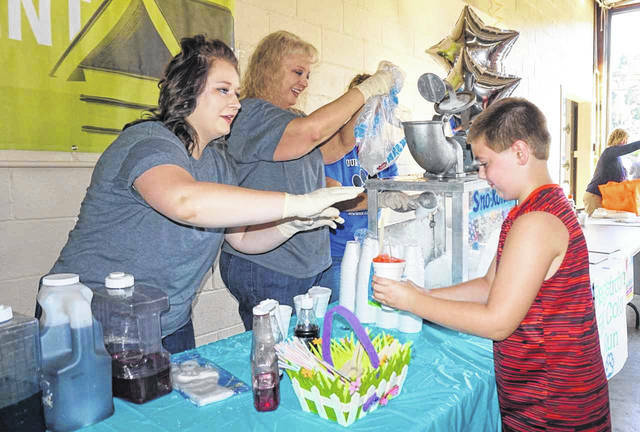 Pictured are employees of City National Bank, as they make snow cones for the children. NEW HAVEN — Children in the Bend Area were treated to two nights of partying prior to the start of school, each sponsored by the Town of New Haven. A “Glow Party” was held Monday evening at the municipal swimming pool. The children were treated to swimming, hotdogs and drinks, as well as glow-in-the-dark necklaces and bracelets. Although a rain storm interrupted the event, forcing it to shut down early, it didn’t stop over 100 people from attending. According to New Haven Recorder Roberta Hysell, Riverside Golf Course assisted in providing the food for the event. Health Aid Pharmacist David Morgan provided glow sticks for the party. On Tuesday evening, the town hosted the annual Back-to-School Bash. This event was held at the fire station, with the main road closed to traffic to allow children to literally play in the street. Hundreds attended the bash, which was one of the largest crowds seen in the long-running event. Sidewalk chalk, bubbles, jump ropes, and hula hoops were all provided, with children bringing their bikes, scooters and skateboards. Bernita Allen provided music for the children to dance. Gino’s of Mason provided pizza, and employees of City National Bank in New Haven attended and gave out free popcorn and snow cones. Vendors were present to distribute information to parents, along with hats and other items to the children. There were drawings for gift cards and other prizes. Backpacks full of school supplies were distributed to those in attendance. Hysell said many individuals and businesses donated both school supplies and money to make the bash a success. She said a sizable donation was received from AEP River Division. Students returned to school Wednesday morning across Mason County.